I don’t know about you, but i usually have more than one project on the go at any given time. I’m not sure exactly why I can’t stay focused on one thing until it’s complete. Perhaps it’s my perfectionist nature. If something isn’t working the way i think it should, i just set it aside and start something else. I’ve been this way for as long as I’ve been sewing, so you can imagine the plethora of partially completed projects i have kicking around the house. Every once in a while, i go back to something I’ve left and try and at least get it to the flimsy stage. i hate to admit it, but i have about 25 flimsies waiting to be quilted. I know. I need to get my s*** together. Several weeks ago, i started reorganizing my fabric storage. I have left it for months after racing to get ready for this trade show or that, and i have fabric pulled from the shelves and piled everywhere in my sewing area. i did some looking around and decided that the best thing for me to do was to use my 6″ x 24″ ruler to help me fold the fabric neatly and stack it on my shelves. It works great! everything is neat and tidy, and i can see all of the fabrics on the shelf. NO MORE DIGGING! Unfortunately, this task has fallen by the wayside, like so many others before it. I got all of my batiks refolded and organized, and a few of the colour groupings tackled. That is where it ended. I don’t know if I’m overwhelmed by the sheer monstrosity of the task, or if I’m just lazy. I seem to have so many things that need my attention and instead of addressing them, i sit on my bum and think about them, and how I’m never going to get it all done. I am fully aware that unless i get off my bum and start, nothing will EVER get done. The first step is getting off the couch. Here i go…..
I’ve had a couple of busy days and haven’t had much time to get to my machine. I do try and sew SOMETHING everyday, even if it’s just a seam or two. I am amazed at how much I can get done in just 15 minutes of sewing. 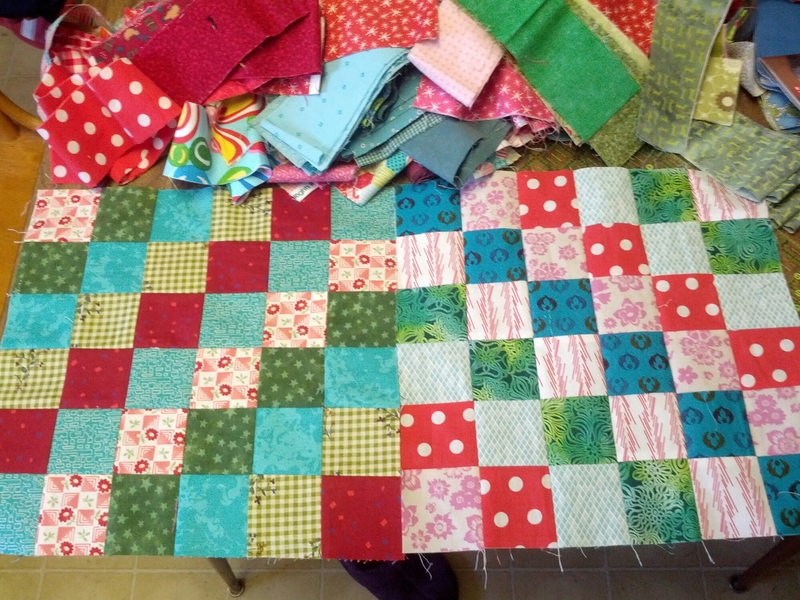 Yesterday, I sewed four strip sets together for my Scrappy Trips, and cut out the sections I needed to make 4 blocks. Today, I got two blocks put together. OK. Enough of the sass. I’m thinking I’m really going to love this one when its done. I may have to bump it up to queen sized so I can use it on my bed. I apologize for the terrible picture quality. Photography is not my forte. Thanks so much for your encouragement. I truly appreciate your kind words. 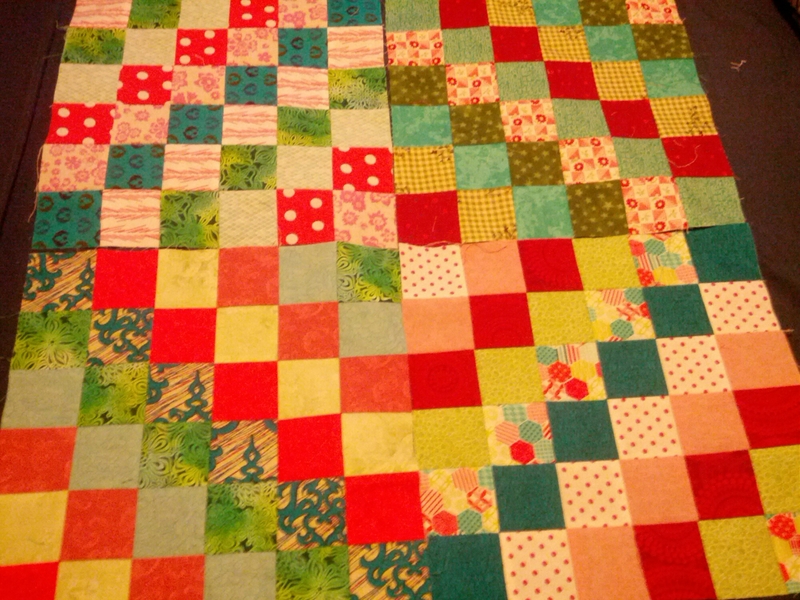 I have been wanting to do a Scrappy Trips quilt a la Bonnie Hunter for quite some time. (pattern here) I’ve been working on taming my scraps, and I’ve had a colour combination brewing for a while. Today I finally got some scrap 2 1/2″ strips pulled. I have no idea how many strips I will need, but I’m not worried about running out, that’s for sure. I really like the first block, but I’m not so keen on the second. It seems a bit too ‘white’, if you will. I will most likely just leave it, cause the thought of picking it out does not thrill me. I’m concerned it will stick out like a sore thumb, but I think I’ll just have to check my perfectionist tendencies at the door and let it be. In fact, that’s exactly what I’m going to do!! I have a confession. I am a fabric hoarder. I have had an obsession with fabric since I was a little kid, going to Fanny’s Fabrics, or Silk-O-Lina with my mom. I loved going fabric shopping with her!! I would fondle all the beautiful fabrics, immersing myself in the beautiful colours, patterns, and textures. I would always stop at the thread displays to make certain that all of the spools were in their proper places, rearranging as needed. Of course, a trip to the button racks were always a must! Who could resist spinning the racks and racks of gorgeous buttons? Not me!!! 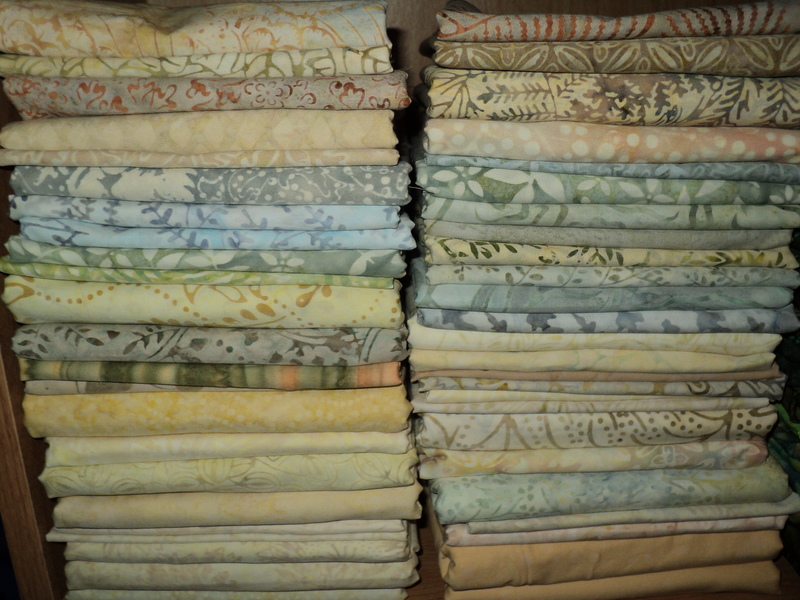 I have been quilting for 19 years now, so I’m sure you can imagine the fabric stash I’ve accumulated. Sometimes I am reluctant to cut into my fabric, especially if it’s one I really love. For the most part, I use more than I buy. 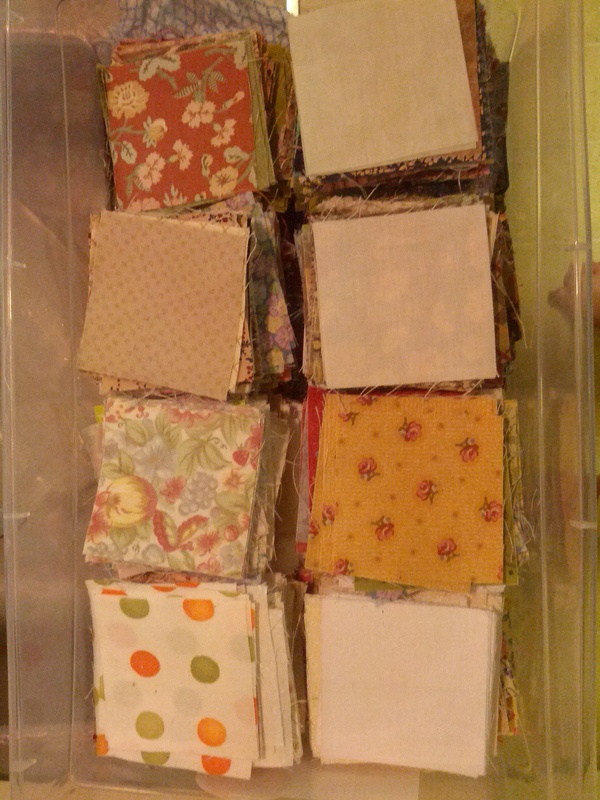 Of course, I can’t throw my scraps out, so I started sorting and cutting using Bonnie Hunter’s Scrap Users System. For those if you who aren’t familiar with Bonnie, you’ll find her website here. She has LOTS of free patterns and she describes her Scrap Users System. There are many different methods for taming your scraps. I don’t think there’s a one-size-fits-all solution. 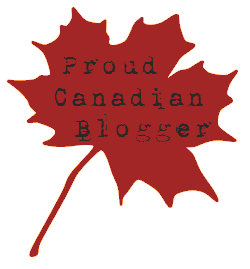 I would do some research on various blogs and forums to get some ideas, and find what works best for you. Do any of you use a particular method for organizing your scraps? Please share it with me!